Be Healthy, Positive, and Thankful! 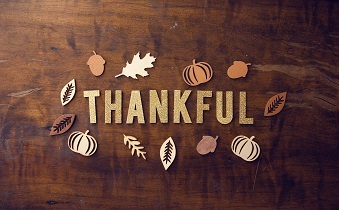 What are you thankful for today? What have you accomplished, overcome or experienced this year that has really put a smile on your face? Thanksgiving Day is always a fun time for me to hang out with my family, eat a delicious meal and on occasion, prepare my shopping list for Black Friday and/or Cyber Monday! As your day settles down, spend about 5 minutes writing down some positive thoughts about yourself, family and friends – You can even make this a group activity! Enjoy your day, take a relaxing walk with family after your meal and remember to be healthy, positive and thankful.